We are happy to announce that Concept Solutions, LLC is on the winning team to improve the Department of Transportation’s (DOT) Cyber Security Programs’ efficiency and effectiveness, as a sub to General Dynamics Information Technology (GDIT). This work includes providing cyber security and policy services through our high-quality, mission-focused information security solutions. The award is a five-year blanket purchase agreement (BPA), where our team will compete against two other awardees on task orders under this vehicle. Concept Solutions, LLC looks forward to growing our cyber footprint across the federal sector, building on our experience with the Federal Aviation Administration’s (FAA) Security Operations Center (SOC) and NextGen program, as well as our cross-agency cyber policy support. Concept Solutions, LLC is pleased to announce is on the winning team for the Federal Aviation Administration NAS Data Integration Services contract, as a sub to Volanno. The work consists of integration and analysis of NAS data, including the CEDAR, Falcon, OPSNET, and the NAS Data warehouse to support operational and performance analysis for AJR-G, Director of Performance Analysis. Concept Solutions is excited to announce that our team has been selected as an awardee on the Department of Justice’s Information Technology Support Services-5 (ITSS-5) IDIQ contract vehicle. We were able to leverage a Joint Venture partnership with Fig Leaf Software to win a spot on this core contract vehicle serving the Department of Justice and its constituent components. ITSS-5 is available to all bureaus within the Department of Justice, including FBI, DEA, ATF, and the Justice Management Division. ITSS-5 provides each component with mission-critical IT services. This strategic vehicle will allow us to expand the base of federal customers that we serve and will be key in assuring Concept Solutions’ continued growth. We look forward to an exciting future supporting DOJ. Concept Solutions, LLC is proud to announce that we have been awarded our first win in 2018 to continue providing the FAA’s NextGen Organization with Systems Engineering, Technical, and Program Management Support. This is our third successful competition supporting the collaboration needs for NextGen, beginning with the Joint Planning and Development Office in 2007. Under this SE2025 Task Order, CS will continue to provide management and advisory support to the Interagency Planning Office (IPO) on a wide range of domains, including: Aviation Cybersecurity; Unmanned Aircraft Systems (UAS); NextGen Weather, Risk Management; Communication, Navigation, and Surveillance (CNS)/ Air Traffic Management (ATM); Systems Engineering, Architecture and NextGen Planning and Implementation; NextGen Research and Development; Commercial Space; and Other Aviation Related initiatives. Additionally, CS will continue providing support to the NextGen Organization’s International Office. This Task Order has a five-year Period-of-Performance, building further on CS’ already ten plus years supporting the FAA’s NextGen program. Congrats to CS and the IPO Team for their win. Veracity Engineering, Inc. is the Prime contractor for this Task Order, which represents a new area of contract opportunities with us. The Next Generation Air Transportation System (NextGen) is the modernization of our National Airspace System (NAS). It is a comprehensive suite of upgrades, procedures, and technologies that improve every phase of flight and enable aircraft to move more efficiently from departure to arrival. At the direction of the NextGen Executive Board (NEB), the Interagency Planning Office (IPO) for NextGen leads congressionally mandated interagency and international collaboration to resolve complex challenges critical to NextGen planning and implementation. Additionally, the IPO leverages stakeholder expertise to identify, research, coordinate, and prioritize shared issues. In accordance with the IPO mission, it facilitates essential collaboration, as required, to promote NextGen activities. Partner agencies include the Departments of Commerce (DOC), Defense (DoD), Homeland Security (DHS), and the National Aeronautics and Space Administration (NASA). The FAA also collaborates with the Office of the Director of National Intelligence (ODNI), White House Office of Science and Technology Policy (OSTP), and other critical stakeholders as needed. The IPO expanded collaboration to include other partners, such as the National Geospatial-Intelligence Agency (NGA), National Science Foundation (NSF), and National Transportation Safety Board (NTSB). Concept Solutions, LLC was recently named as one of the 2018 Best Places to Work in Virginia. The annual list of the Best Places to Work in Virginia was created by Virginia Business and Best Companies Group. This is the sixth consecutive year Concept Solutions, LLC has been recognized as a Best Places to Work in Virginia. – Be in business a minimum of 1 year. Companies from across the state entered the two-part survey process to determine the Best Places to Work in Virginia. The first part consisted of evaluating each nominated company’s workplace policies, practices, philosophy, systems and demographics. This part of the process was worth approximately 25% of the total evaluation. The second part consisted of an employee survey to measure the employee experience. This part of the process was worth approximately 75% of the total evaluation. The combined scores determined the top companies and the final ranking. Best Companies Group managed the overall registration and survey process in Virginia and also analyzed the data and used their expertise to determine the final ranking. For more information on Concept Solutions, LLC, visit www.Concept-Solutions.com. ConceptSolutions has been awarded a 2017 Top Workplaces honor by The Washington Post. The Top Workplaces lists are based solely on the results of an employee feedback survey administered by WorkplaceDynamics, LLC, a leading research firm that specializes in organizational health and workplace improvement. Several aspects of workplace culture were measured, including Alignment, Execution, and Connection, just to name a few. We are honored to have been selected for this award by our employees. Concept Solutions, LLC was recently named as one of the 2017 Best Places to Work in Virginia. The annual list of the Best Places to Work in Virginia was created by Virginia Business and Best Companies Group. This is the fifth consecutive year Concept Solutions, LLC has been recognized as a Best Places to Work in Virginia. This statewide survey and awards program is designed to identify, recognize and honor the best places of employment in Virginia, benefiting the state’s economy, workforce and businesses. The 2017 Best Places to Work in Virginia list is made up of 100 companies. The final rankings will be announced at an awards luncheon on February 2, 2017 at the Williamsburg Lodge in Williamsburg, VA.
Concept Solutions celebrates 17 years! 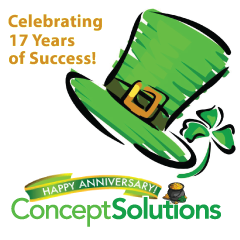 Today is Concept Solutions’ 17th anniversary. During these 17 incredible years, Concept Solutions has supported many great clients across numerous industries and has had the privilege of working with and for many remarkable people. Over the past 17 years, Concept Solutions has achieved numerous corporate recognitions, including 7 straight years on the Deloitte Fast 500 rankings and 4 straight years on the Best Places to Work in Virginia annual list. None of this would have been possible without our talented and dedicated employees. It is with this team of professionals that Concept Solutions has been able to build an ever growing portfolio. This includes FAA SE2025 (SIR I and II), FAA eFAST, US NAVY SEAPORT-E, GSA STARS II, DISE Encoure II, FDIC ITAS II, and a rapidly expanding pipeline leading to USPTO, NOAA, and NASA. Concept Solutions takes this occasion to let each and every employee and customer know how much they are appreciated and looks forward to working with you all in the years to come. https://www.concept-solutions.com/wp-content/uploads/2016/03/CS17.png 240 240 admin /wp-content/uploads/2018/08/CS-logo-bluetext.png admin2016-03-17 14:02:262018-07-26 20:58:58Concept Solutions celebrates 17 years! Concept Solutions, LLC, a leading management and technology consulting company, is pleased to welcome Ms. Gisele Mohler as its Client Relationships Director. Ms. Mohler will support strategic growth initiatives, as well as strengthen the partnerships between the company and its customers. Ms. Mohler was with the Federal Government for 23 years, most recently as the Director of the Federal Aviation Administration’s (FAA’s) Interagency Planning Office for the Next Generation Air Transportation System (NextGen), where she oversaw and executed the collaborative processes needed to ensure efficient coordination among all federal partners whose decisions impact NextGen. The federal partners include the National Aeronautics and Space Administration (NASA), and the Departments of Defense (DoD), Homeland Security (DHS) and Commerce (DOC), the FAA, as well as the White House Office of Science & Technology Policy, and the Office of the Director of National Intelligence (ODNI). Previously, Ms. Mohler was Director of the FAA’s NextGen Performance and Outreach Directorate, where she delivered the agency’s annual NextGen Implementation Plan, as well as NextGen results by developing and delivering NextGen Performance Snapshots. In between her two executive roles for NextGen, she was the FAA’s acting Executive Director for Regions and Center Operations. Ms. Mohler was also the Director of the FAA’s national plan for improving airspace and airport capacity, the Operational Evolution Plan (OEP), for four years. Additionally, she spearheaded the initial Airspace and Procedures Metroplex (OAPM) effort where she designed and tested a process to take a systems approach to performance-based navigation (PBN) initiatives and the design of airspace, providing a geographic focus to problem solving. This process is being used today for OAPM. Prior to the FAA, she was with the U.S. Census Bureau for eight years where she implemented acquisition reform for conducting the Decennial 2000 Census. She holds a Bachelor’s degree from the University of Maryland, an MBA from Johns Hopkins University, and a Certificate of Executive Professional Development from the Wharton School of Business. Ms. Mohler is a private airplane pilot with instrument, land, and sea ratings and owns a single-engine plane.